This was a short run, 5.6 miles, yet at about 3.5 miles I felt so weak I doubted I could carry on. In the event I walked up a hill and finished reasonably well. The conditions were splendid, a typical English country Sunday, larks sang overhead, flies flew into my mouth, and idiot ramblers blocked my passage. Then I realised that I ran today for the first time for a fortnight. So, while I thought that next Sunday's half marathon might be in doubt, I hope that. with a week of running in Rome in front of me, I may finish next Sunday in not too disgraceful a time. This is the way things should be; as I was going to a symposium at the University of Sussex today, I was able to rise late and run at 7 in the morning. I went up South Hill, down to the coastguard cottages, past Hope Gap and back over the top of Seaford Head. The ascents and my breathing were easier, the sun shone, and as I started the descent of Seaford Head, I could smell the seaweed below at Splash Point, and passed kittiwakes at play. The Garmin ran out of battery, but I think it was about 4.5 miles. I took myself inland today. up to Fiveways and back. My legs hurt and at times my lungs felt as if a large heavy animal were sitting on them. It's a nostalgic route, covering ground I used to run over when we lived nearer there. But Firle Beacon has not trembled under my feet for some time. I'm still unsure about the possibility of the Seaford Half Marathon. 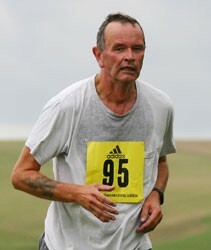 I have, however, entered the 2011 Brighton Marathon, and also committed myself to the 2010 Juneathon. At what time of day does the wise man run? When he can. But with a whole day at my disposal, today, I can find myself paralysed by choice. Weeks pass when I have no time to run and then I can run whenever I want. Should I run first thing in the morning? There's a lot to be said for it, the rest of the day is before me but then again the Burra Mem is off to work, I have the bed to myself, and I can recover from my curious dream in which I was being disciplined by my employer for unauthorised use of an air compressor. I devise a plan: I shall run before lunch, then shower and go to the sailing club, where I would eat Jane and Clive's chicken and chorizo stew, followed by her orange-flavoured version of îles flottantes, the whole accompanied by a pint of Adnams. It was not to be. The Chota Mem, that is to say Number Two child, required me to run her to the station so she could go to Brighton to 'hang'. Number One child needed me to take him to work, and deposit his girlfriend en route. I gave up; running would have to wait. After an agreeable lunch, as described above, I took a couple of hours to digest and then went out to run 5.56 miles, my first run for a fortnight. I ran under low grey clouds, along Chyngton Road and up the hill to the barn. At the top I headed down the hill towards the Golden Galleon. In this light and at this time of year, the new growth on the trees in Friston Forest shone with a striking hue of green. The paths along the side of the Cuckmere know only two states of existence: rutted and hard, in which case I constantly dread a fall and the consequent knee damage, or a swamp of mud, in which case I fear a slip and a mud-bath; today they were rutted and hard. Then, once I passed the coastguard cottages, I ran along the cliffs. There is a long ascent here in a v-shaped valley, and I tolied up, watched by a coach party of miserable French school-children. Here, for the first time, I had difficulties. My calfs stang, and my lungs seemed to have an obstruction halfway down. I made it to the top and ran past the deserted golf course and down Seaford Head and home. By hook or by crook, I must run more often.